QA Graphics will exhibit at the AHR Expo, Jan 30th-Feb 1 in Las Vegas, to share their creative design capabilities with over 60,000 HVACR professionals - Visit QA Graphics at booth #C1489. QA Graphics, a leader in the building automation system (BAS) graphic outsourcing industry, will be returning to exhibit at the AHR Expo to share their creative design capabilities with over 60,000 HVACR professionals. 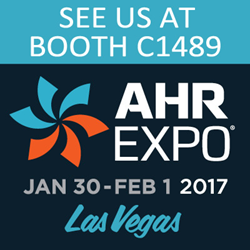 The AHR Expo will take place January 30th through February 1 at the Las Vegas Convention Center in Las Vegas, Nevada. Attendees are invited to visit QA Graphics’ booth, #C1489 to learn more about the company and their comprehensive design services. QA Graphics’ will be demonstrating their HTML Energy Efficiency Education Dashboard®, an interactive dashboard platform that allows for building owners to engage the public, helping them to become educated and more aware of everyday green practices, creating a sustainable building for years to come. QA Graphics is proud to have an innovative product that not only helps fulfil the needs of the customer, but has a positive impact on the future of sustainable and green building awareness. The release of QA Graphics’ new BAS Symbol Library v5 will also be present at the Expo for visitors to view and learn. Giving users access to high-end graphics and animations that more realistically represent the mechanical systems in place. This library offers a competitive advantage in the BAS industry, delivering more appealing and realistic graphics than typically provided with BAS software. The Symbol Library v5 is powerful and includes over 450 total graphic files available, more detailed graphics, and higher resolution images. To learn more about the AHR Expo or QA Graphics’ creative design capabilities visit http://www.qagraphics.com or http://bit.ly/mapmyshowAHR17. About AHR Expo - As the largest and most comprehensive HVACR exposition in the world, the AHR Expo attracts tens of thousands of attendees from all facets of the industry. Since 1930, the AHR Expo has been the HVACR professional’s best resource for new products, new ideas and new services. This unique industry forum creates a dynamic marketing environment unequaled in size and scope by any other industry event. To learn more visit: http://ahrexpo.com/.